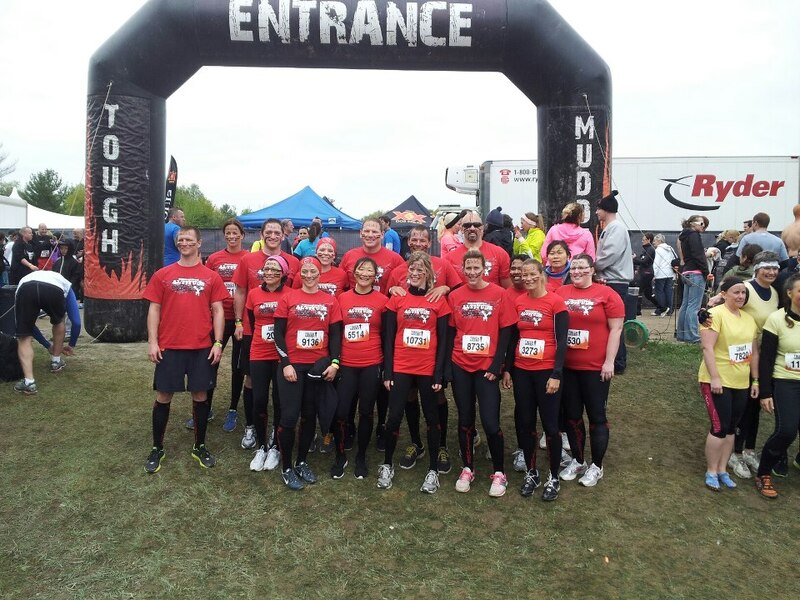 I participated in the Tough Mudder at Mount St Louis Moonstone this past Saturday. If you haven’t heard, the Tough Mudder is a “10-12 mile obstacle course designed by British Special Forces to test your all-around strength, stamina, mental grit, and camaraderie”. And test it, it did. But with every test, comes a lesson, and on Saturday, there were many. I learned that the ‘Arctic Enema‘ is in fact, as awful as it sounds. Ice cold water stole my breath and my voluntary muscle control. I learned to ask for help. I learned that ‘Walk the Plank‘, a 15+ft jump into water, left me paralyzed with terror. The sound of dozens of people chanting my name, and the side-by-side support of my husband finally give me the courage to jump. I learned to rely on the support and togetherness of my team. They would not let me quit. I learned that the anticipation of the electric shocks from the ‘Electric Eel‘ obstacle are worse than the shocks themselves. I learned that putting your head down and just going for it often beats over-analysis. I learned that the ‘Berlin Walls‘ require strength and balance to conquer. I learned that my teammates will boost me up and will not let me fall. I learned to trust blindly. But you know what the best part was? There was no clock. I loved that there was no clock. I loved that there were no timing mats. I loved that there were no chip times. I loved that we had to recite ‘this is not a race’ before we began. I loved that there were no finish times posted on the Tough Mudder website. In our results-driven society, we often miss out on opportunities to learn the hidden lessons. And it was the hidden lessons at Tough Mudder that taught me the most. There was camaraderie. There was teamwork. There was friendship. There was accomplishment. There was effort. There was sheer will. But most of all, there was fun. I am a Tough Mudder. This entry was posted in Fitness, Opinion and tagged camraderie, friends, mud, obstacle, teamwork, Tough Mudder. Bookmark the permalink.